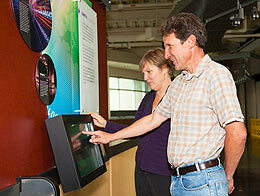 The NCAR Wyoming Supercomputing Center (NWSC) represents a collaboration between NCAR and the University of Wyoming. Through the Wyoming-NCAR Alliance (WNA), 160 million core hours of the Cheyenne system, is available for Wyoming-led projects in the atmospheric, earth system, geological and related sciences. Large allocations are overseen by the WNA Resource Advisory Panel (WRAP); a University of Wyoming-managed process. In addition, allocations may be given to support faculty’s integration of high performance computing in their undergraduate and graduate courses, and to support initial code development, experimentation, application testing and data analysis to be used to strengthen a future grant proposal. Resources may also be made available to a small number of projects funded by other government agencies or by the private sector. To access the NWSC supercomputers, storage systems and data analysis and visualization resources, users must apply for allocations. Applications are reviewed and time is allocated according to the merit and needs of the projects and the availability of resources. Project-based. Allocations for UW’s portion of NWSC resources are allocated through project that has a single principal investigator (PI), and may include allocations to one or more resources (e.g. compute time, high-performance storage, data acquisition and visualization). The PI uses the same project to request or renew an allocation, as the focus and computational activities evolve throughout the process. Usage metric. The core-hour is the basic unit to measure and track the usage of NWSC resources (including the NWSC supercomputers, high-performance storage system, data analysis and visualization systems). Eligibility. All University of Wyoming faculty are eligible to apply for an allocation. Large Allocations must be explicitly linked to funded, peer-reviewed research projects in atmospheric, earth system, geological and related sciences (list of approved areas). An allocation request from a UW researcher can include allocations for collaborating researchers from other US institutions who are PIs or senior personnel in the funded project. Large Allocation requests will be evaluated semi-annually by the WNA Resource Advisory Panel (WRAP). Small allocations. UW graduate students and post-docs, and UW faculty working towards creating data, testing algorithms, etc., for a future grant proposal are eligible to apply for a start-up allocation. No panel review is needed for small allocation requests, and such requests can usually be accommodated within a few business days. Small allocation requests can be made at any time using the online form available by selecting the Small Allocation Form tab on the left. Educational allocations. NWSC encourages the use of high-performance computing in undergraduate and graduate courses at UW or Wyoming Community colleges and accounts can be provided to individual students and the instructor for assignments involving numerical simulations, modeling, and use of recently developed computational architecture. Faculty needing to use a NWSC resource for an undergraduate or graduate course they are teaching should send e-mail to alloc@uwyo.edu describing the anticipated software needs, storage and computing usage at least two weeks prior to the start of the semester the course is taught. If the anticipated usage is more than 100,000 core-hours for the class, then WNA will want an extended abstract describing how the resource estimate was calculated. If anticipated usage for the class is more than 400,000 core-hours, then a large allocation request must be submitted for WRAP review. Duration. Research project and small allocations are for one year. Educational allocations are for the duration of the related class. Download slides about the allocation basics and advise on preparing a request. 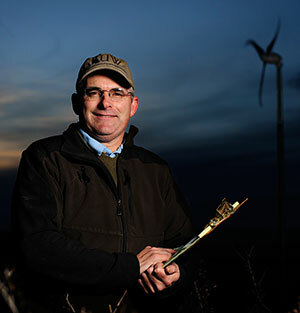 April 17, 2017 — Jonathan Naughton, University of Wyoming Department of Mechanical Engineering professor, will give the spring Faculty Senate Speaker Series talk Tuesday, April 25. 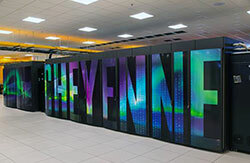 January 30, 2017 — The National Center for Atmospheric Research (NCAR) launched operations this month of one of the world’s most powerful and energy-efficient supercomputers, providing the nation with a major new tool to advance understanding of the atmospheric and related earth system sciences. October 2, 2012 — A simulated mini-tornado, various short videos depicting everything from wind to wildfire simulations, and a number of interactive touch-screen kiosks will make their debut and help the science come alive when the NCAR-Wyoming Supercomputing Center (NWSC) is ceremonially opened Oct. 15 by an invite-only delegation composed of the many partners behind its construction.